Used in Health Clubs worldwide because of its outstanding quality, durability and overall reliable track record, from the novice walker, to the most advanced athlete or long distance runner you'll get the most out your workouts when using this top of the line commercial model. With a multitude of program options including an incredible speed range of up to 16mph, the 956i offers a fantastic shock absorbing deck system that better protects ankles, knee's, hips and lower back like no other commercial treadmill on the market today. Providing quality fitness solutions that work, Precor fitness equipment keeps it's users satisfied no matter what their goal. Precor inspires a life in motion. The 956i is purpose-built with features for durability in high-use environments. It’s equipped with Integrated Footplant Technology™ (IFT) and Ground Effects® (GFX) impact control system, to deliver a smooth and natural feel when running or walking. The IFT-drive controller works with the 4.0 horsepower AC motor to provide proprietary Integrated Footplant Technology -- controlling belt speed to be responsive to every step for a smooth, natural feel while running or walking. Easing wear on the knees, legs, and back, the unique suspension system cushions impact and controls lateral motion, while remaining responsive. Deck: Ground Effects® Impact Control System - Easing wear on the knees, legs, and back, the unique suspension system cushions impact and controls lateral motions while remaining responsive. Ground Effects Impact Control System controls lateral motion, this maintains a soft and responsive deck surface to suit the users running characteristics. Fully integrated Cardio Theater® design, with personal viewing screens or ambient viewing enhances you or the members experience by offering a more seamless, premium look to your cardio area. Six buttons are the gateway to 26 preset programs, including six fitness tests. Users can select or change to a new program at any time during their workout. Large buttons provide satisfying tactile response and audible click. Beginners and experts alike easily get on and go with this intuitive control. Users know the machine has received. Low step-up height allows comfortable access when mounting and dismounting.Heart Rate Monitoring Technology: Touch heart rate monitor. 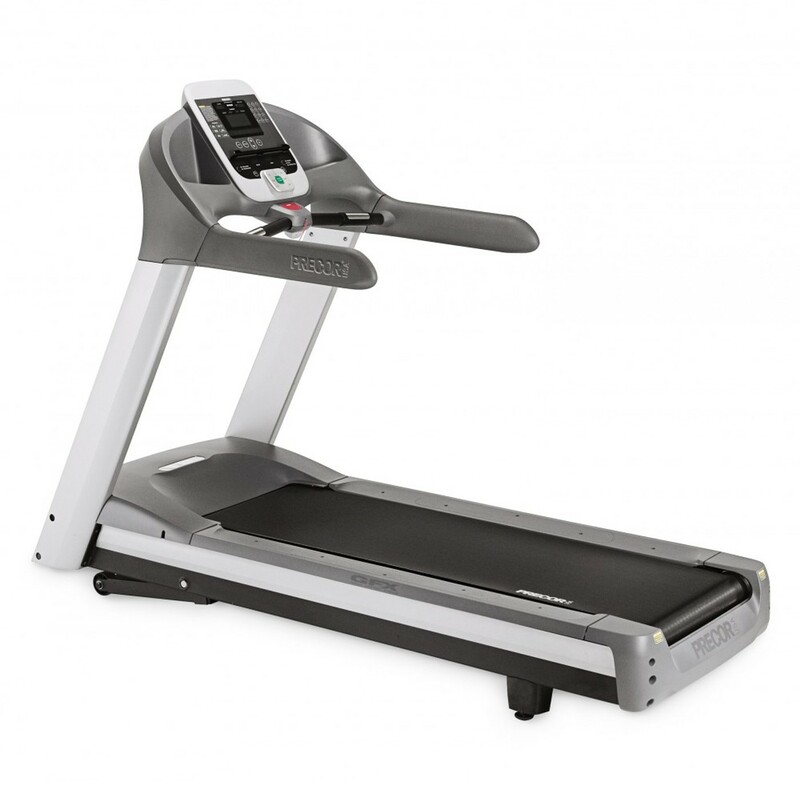 Featuring new and innovative technologies, incorporated into the 956i's design structure, this Experience Line treadmill offers integrated Footplant Technology. Using micro – processors to measure the smallest change in a runners speed, the belt is adjusted accordingly, doing this up to 100 times per / second. Whilst Pulse sensors in the hand grips monitor your heart rate, on top of the console is a rack for your water bottle, reading material and cell phone. The deck can also be flipped over, effectively doubling its life. Heart Rate Control; basic, custom weight loss, weight loss. Running deck dimensions: L 60”x W 20”.